Our team at Brock Doors & Windows wants to assist you in choosing the best, most beautiful memory-making front door for your home. Here’s a quick guide to narrowing your Toronto entry door options! What goes best with your home’s architecture? Not sure? We can help you zero-in! To get your wheels turning, try to categorize your home’s style (or the style for which you aim). Do you have a country home or is it more modern? Are there vintage overtones you want to honor with similar detail? Or, is your home a basic palette in need of some flair? Brock Doors & Windows is leading in home design; let us help! There is no reason you should need to settle for a plain front door. Together, we will match your home and preferences perfectly. 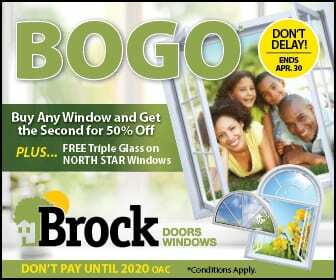 At Brock Doors & Windows, we offer only the best in quality products. After all, we want our clients to be satisfied for years to come. We stand behind the top varieties: Dorplex, Fusion, Miliano, Novatech, Verre Select, Trim Lite, and MasterGrain. Why do we stand behind these? As you will find, their value is in their detail. These collections each offer unique looks: modern, highly-detailed, exquisite grain, unique glass options and designs, customization options (we’ll help you with this! ), and unrivaled durability. These days, many clients are leaning toward vibrant colors in order to set apart their front door from the rest of the home. Of course, this is your home and your choice, but we thought a bit of insight on “what colors say” would be helpful! Red: Known as the life-giving color; power, strength, and vitality. Very popular! Orange: Communicates entertainment and light-heartedness. Yellow: The color of positivity, logic, and creativity. Green: Earthy colors like this suggest a family with traditional, wholesome values. Turquoise: Feminine and romantic. Perfect for an all-girls home! Gray: For the modern, sleek home with owners who prefer balance and compromise in life. Wood: Also for the traditional aesthetic; natural finish represents a grounded and centered family. Black: Behind a black front door is a home of regulations and order; elegance and structure. White: Clean lines, simple and yet still chic. Isn’t it time you love your front door and enhance your future memories? We cannot wait to work with you! Give us a call or visit our Toronto Showroom at 2131 McCowan Rd, Scarborough, ON M1S 3Y6.